Members of the Eastside Mission Church in Delaware spent Monday prepping Thanksgiving meal baskets for the local community. 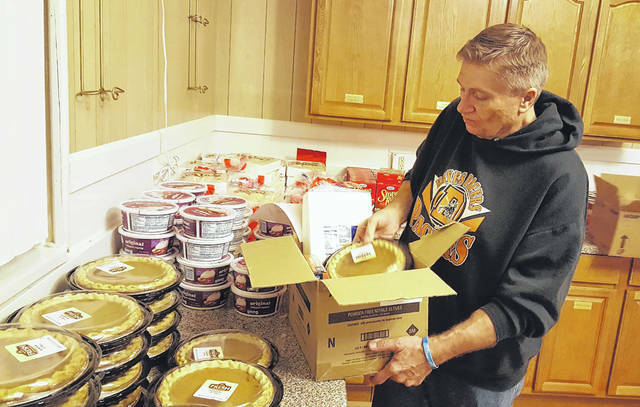 Pastor Donnie B. Akers loads a pumpkin pie into one of 37 boxes the church distributed on Monday, just in time for Thanksgiving. 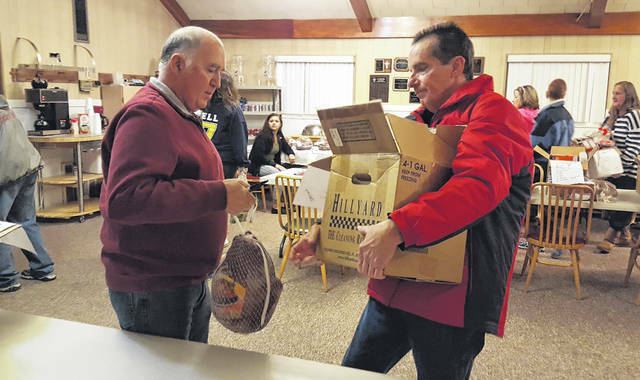 Eastside Mission Church members Darrell Howell, left, and Carl Huggler, right, load up a Thanksgiving meal basket that was delivered to a local family. There are a number of reasons why the congregation at the Eastside Mission Church in Delaware chooses to go above and beyond during the holiday season to help the less fortunate, one of which is fittingly written on the street sign in front of the house of worship — Joy Avenue. Whether it’s providing Thanksgiving meal baskets or giving children something to look forward to on Christmas morning, longtime church member and food pantry coordinator Jessie Neville says nothing tops the joy that comes from making a child’s life a little brighter during the holidays. For the past 15-plus years, the church, located at 32 Joy Ave., has been providing Thanksgiving meal baskets to families in need. Packed with a turkey and all the trimmings — including a pumpkin pie and Cool Whip — the church distributed 37 such baskets on Monday to local families. “When we started our food pantry years ago, we were able to help two families with food on Thanksgiving,” Pastor Donnie B. Akers said. “It just started moving upward, and it has been growing ever since. “I’ve always wanted to not keep everything in the four walls of the church, but to help our community. That’s what Jesus would do — help the poor,” Akers added. Neville, who has organized the Thanksgiving meal outreach for the past 15 years, said while the congregation donates most of the items for the meal baskets, several local companies have stepped up to help, including the Scotts Miracle-Gro Company of Marysville, Kroger, Aldi, Meijer, and the Delaware Maurices clothing store, which is currently giving out a 20 percent off coupon to any customer who brings in three canned goods, which will be donated to the church’s food pantry. Neville is hopeful that one day the church will be able to expand the Thanksgiving outreach to help even more families. “One of these years I’d love to be able to open the doors to do a dinner here,” she said. Until that day, Akers added, the church, which has seen its congregation bloom over the past 15 years from 45 parishioners to 175, will continue helping as many Delaware area families as possible during the Thanksgiving holiday. “God has helped our church greatly to be able to help others more than we used to be able to, and come Thursday, we can sit down to eat feeling good that we’ve been able to help some folks,” Akers said. While the Eastside Mission Church also distributes meal baskets for Christmas that includes a ham and all the fixings, its annual toy drive has become the church’s largest outreach effort, helping bring smiles to the faces of countless children on Christmas morning. An idea that was born six years ago when church members Travis and Amanda Jordan suggested the church collect toys to donate to Nationwide Children’s Hospital in Columbus, the toy drive has been well-supported by the congregation and local community, including places like Walmart and the Fraternal Order of Eagles No. 376. “We collected 250 new toys the first year, and last year we were able to collect 2,000 toys,” Akers said. Due to the success of the toy drive, the church not only donates to Nationwide Children’s Hospital, but it also helps local children by donating toys to various Delaware area nonprofits, including Family Promise of Delaware County, Common Ground Free Store, Salvation Army, and William Street United Methodist Church. The church’s annual toy drive will take place from 11:30 a.m. to 1:30 p.m. on Saturday, Dec. 2. Anyone wishing to donate is asked to drive up to the Willow Street side of the church where volunteers will be waiting to collect new, unwrapped toys. For information, go to eastsidemissionchurch.com.